Don’t you love falling in love with dark things that tell half truths? They draw you in by dangling a shiny bobble of hope, tell you a few true secrets, hint at things that are possible, swaddle you in a blanket of fantasy, then cast you out into the blinding light disoriented and alone. When we talk about unscrupulous men with these characteristics, my friends and I know that these guys are simply creeps with bad characters who have a few party tricks that they play until they’re played out, then they disappear. Good riddance to bad rubbish who do girls the favor of disappearing before their demons really bare their teeth. But what about archaic mysteries hidden in the rocks? They coax a girl in, swallow, and then abide, always to intrigue the imagination and yet never to release their full trove of secrets. They will never disappear. Those cruel masters will holds us in their thrall for lifetimes, for millennia. I’m talking about mysterious ceremonial caves of the ancients. In Anza Borrego desert I stumbled upon a powerful den that has me completely enraptured. I was ambling along a hillside, scanning boulders for Kumeyaay indian mortar holes when I saw an opening. It appeared to be an entrance to something. There was a very faint insignia over the entrance of a sun. Oh, how the darkness beckoned. It dangled one shiny bobble and my heart burst open with hope. 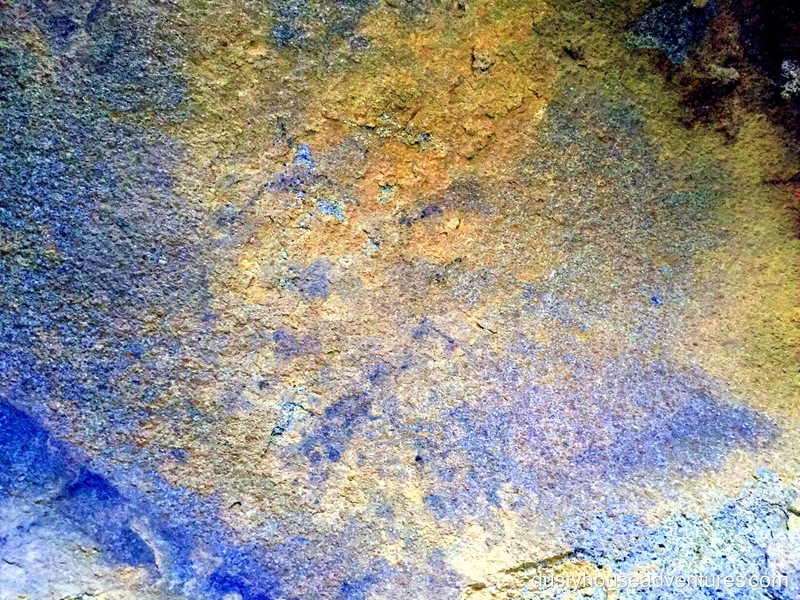 As I looked very closely I could see that there were several other faint and faded paintings on the same boulder to either side of the sun. At first glance it looked like this was a two-room shelter with one cave off to either side of the entrance. Both were large and would have sheltered several people. To the left of the entrance. Some interesting debris had washed up near the entrance. Some spiraled nails, drink tops, a shard of bone, and a wonderful opalescent pink stone. I speculate that the pink stone was a bit of polished shell. It was alluring and I wanted very badly to take it home, try to find out what it is, and put it on a necklace. That thing was in and out of my pocket a few times, but the angel on my right shoulder kept yelling, “Felony!” “But who will ever know?” countered the demon on my left shoulder. So the angel pulled out the big guns. It evoked the spectre of the Brady Bunch episode when the kids stole the totem from Hawaii and with it brought a curse. I reluctantly placed the pink treasure back where I found it and thanked the Kumeyaay spirits for letting me hold it for a moment. As I gawked around the inside of the shelter with my mouth agape I noticed that a narrow opening lead to a dark chamber behind. I crawled back in and found myself nestled right in the belly of the beast, the inner sanctum. In the dark is the inner sanctum. If you are at all sensitive to energy around you, you will know what I mean when I say this place had power. It was a dark black space with natural perches for seating and a sand floor. I fished my flashlight out of my backpack and the first thing that greeted my eye were the images of an animal and another two-legged creature. Below these two images was the thing that made my stomach drop. A natural, beautiful, heartbreakingly evocative hole of emergence. The pueblo indians use the term Sipapu to refer to a hole in a ceremonial space “where the mythical tribal ancestors first emerged from the primordial underworld regions into the earthly realm.” (Merriam-Webster) I don’t care if you are a primordial human or a housewife from Calabasas, no human could look into this this small tunnel in the back of the cave and not feel the pull of eternity. It was a birth canal inside a birth canal inside a birth canal…forever. What a magical place. In my mind I called it The Infinity Hole, thus I’ve privately named this cave The Infinity Cave. I was floored and was instantly wrapped in its spell. I was timeless. In this cave a shaman had brought forth spirits of creation. The memory of those events bathed the walls and I was now part of it. I sat down to organize my swirling thoughts and collect my emotions. As I relaxed and my eyes adjusted to the darkness another image presented itself, a handprint in relief. The shaman had placed his left hand on the stone and then blew pigment over it to create a silhouette. To my right I saw another one. I held my hand up next to it. It was a little bigger than mine. I am not touching the rock. Never touch a pictograph or a petroglyph. It hastens their decay. 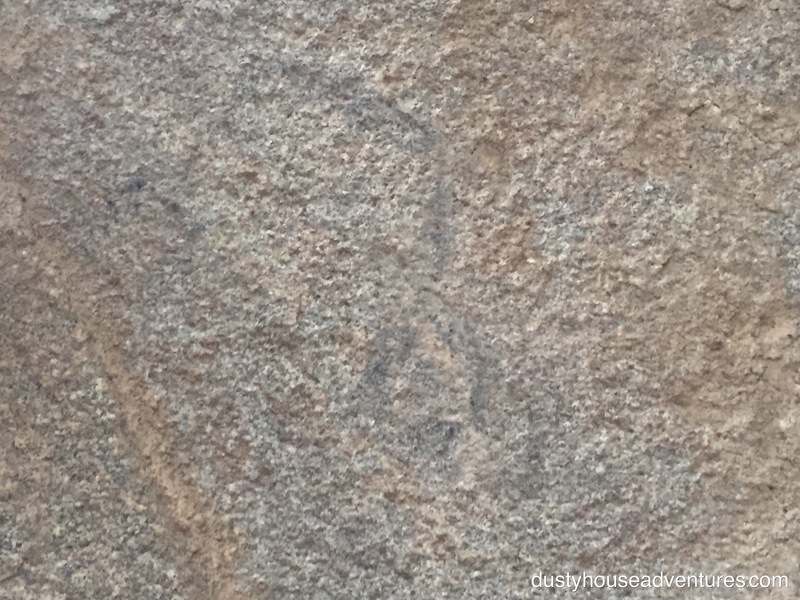 Even a petroglyph (which is carved in stone) has a layer of mineral over it that can be tested by scientists. The oils in your hands erode that layer and obscure future understanding of these irreplaceable sacred treasures. There were more pictographs in this cave, but they had been obscured and destroyed by pinheads who spray painted over them. A badly damaged black pictograph and some horrifying spray paint. Some people say that it is impossible to interpret pictographs and petroglyphs and we shouldn’t even try. I think that opinion is for lazy-minded people who don’t want apply themselves to learning or simply can’t imagine how to start. In fairness, this opinion is sometimes held by highly educated archaeologists who don’t cross very far over the interdisciplinary lines between the fields of archaeology, anthropology, ethnography, linguistics, cosmology, etc. Some people stick stubbornly to their niche and its a problem in the scientific world that sometimes keeps progress from being made. Some very exciting progress in historical ideas is made by independent lay researchers who pull together several disciplines to come up with new hypotheses that prove to hold up scientifically and encourage new scientific inquiries into conclusions that were thought to be settled. While I agree, to a certain extent, that you can’t ever precisely know what was in the heart of the artist, it isn’t as if we’ve been dropped from another planet to this strange earth full of unknowable information. We are humans with history, and since the time of contact with Europeans, some very earnest and diligent people made the wise choice to record the old ways of the Southwestern natives. At the dawn of the 20th century anthropologists made a strong effort to make audio and written recordings of the stories of surviving elders who were only one or two generations removed from pre-contact. And, let us remember, that Native American culture was passed on verbally and there are many tribes that still flourish in their traditional culture and maintain, record and share their ethnography. There is actually a large body of reliable knowledge about the old ways and the imagery that accompanied it. Sometimes, educated readings can be made of cave art when the images are considered in their context. I’ve seen tour guides and curiosity books that glibly rattle off definitions of certain images as if there is a dictionary of translations that always render the same meaning every time an image is presented on stone. That is foolish. Images have slight variations depending on region and certainly depending on context. I’ve been dedicating myself to the study of southwestern ethnography of the various language groups and their imagery on stone. I’m certainly a beginner, but I am starting to be able to recognize a few clues that hint at what an image is communicating. What’s important to know is that rock imagery was only rarely created casually, by bored teenagers trying to while away the hours (tending sheep, for example). It was sometimes created to record significant events or map directions. Usually it was create by a shaman, especially in the case of petroglyphs which were time consuming to etch, as a form of sympathetic magic — imbuing an image with the power of a spirit to influence human events. I’ll try to do a cursory interpretation of The Infinity Cave. It is a dark hidden boulder cave with a chimney like opening to the west which may let in a shaft of light around sunset. (I was there in the morning, so I can’t say for sure if evening light is a feature, but its a note worth putting a pin in.) 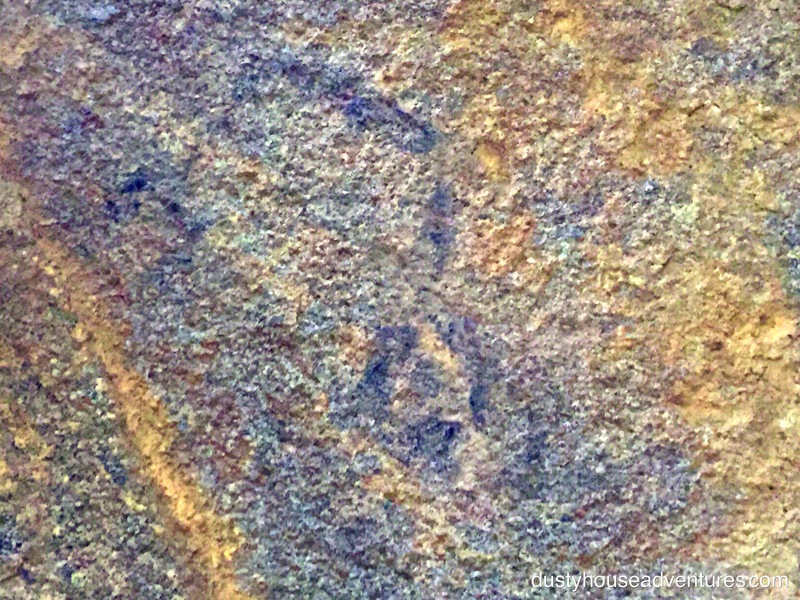 There is a main panel at the back of the cave with a Left Hand Print to the left, a Biped near the bottom left, an Animal toward the upper right, and another Left Hand Print at the right. There were some other images a little further right that have been lost. Between and beneath the first Hand Print and the Biped is a crack that opens to an Infinite Birth Canal hole. These are the cold hard facts. Now to try to interpret them. A dark cave that invites one through a birth canal obviously evokes the idea of being in a womb and being beckoned to pass through the birth canal. However, there is a chimney-like opening in the cave, so it is possible that the reverse is true. A ceremony in this chamber could celebrate spiritual evolution from the underworld, birth into the world and then ascension to the heavens/a higher plane. I’m not going to conclude that either of these was the case, but certainly something along these lines was the spirit of what happened in this cave, as opposed to a celebration of spring flowers. You catch my drift? Left Hand Prints. The right hand is the common hand. It is used for eating and menial tasks. It is ceremonially unfit for sacred use. The left hand, on the other hand (Ick. A pun. ), is used to place ritual items. The left hand is the sacred hand. So we know that this hand print was made with a spiritual purpose, as opposed to marking something more prosaic like a signature (which has its own spiritual significance, but doesn’t fit this context). The handprint is fairly large so it is probably a man’s handprint. The Animal. When taking into consideration all of the desert animals, the only two that meet the criteria of having long straight ears and a long tail are the coyote and the now-only-in-captivity Mexican Wolf. (Incidentally, there has been such thing as domesticated dogs kept by natives if the southwest for hundreds of years as well. So you can’t totally rule that out as a possibility.) The coyote carries his tail down, but the wolf carries it up more like this pictograph. Coyotes have a few different interpretations in Native American art. They usually appear in stories as a trickster, but they have another significance that may be more relevant and is related to the wolf, especially considering that this cave is so close to Baja California. There are a people in southern Baja California called the Guaicura. Their tradition tells that a dog was their maker. In that culture a dog (coyote, wolf) is a symbol of creation. We are in a cave that features a birth canal so it is possible that this coyote/wolf image is depicted to call forth the life giving energy of this Creator being. And here’s a twist. We know that pictographs (as opposed to petroglyphs) don’t even show up in the Anza Borrego until a couple of hundred years ago. It is possible that this cave was not painted by the Kumeyaay who were the ancestral inhabitants of the land, but by some other migrants who settled here, at least for a time, from Baja California or another part of Mexico just a few miles away. The Jesuits and Catholics invaded the Guaicura homeland in the 1700’s and that event certainly would have sent some of the Guaicura in search of safe haven far away. Maybe this cave was actually painted by members of the Guaicura tribe? One last thing I might as well mention is that, in Zuni territory to the east, the wolf is the totem of a “medicine society”. The Biped. This one is tricky, but I’ll try my hand at it. Here’s what we have for sure. We have two feet on the ground, we have two horns, and the being has a solid body (not see-through). Two feet on the ground indicate that it is a real person in real life, probably not a spiritual being or a shaman whose floating around all tripped out on hallucinogens. The solid body likewise represents a real person, not a supernatural being. Horns are a symbol of power. (The most powerful animal in the herd has the horns.) Horns also reach to the sky, thus making one closer to powerful celestial spirits. Given these clues, there are a couple of strong possibilities for the image. It could be a person wearing a headdress or a person holding a shield. Since there doesn’t seem to be anything in this panel that refers to war or defense, the more likely possibility is that the image represents a powerful shaman wearing a headdress. Although, if the angled lines sticking out of the square are arms, they are hanging down in a passive position, not raised to the sky in an attitude of prayer or blessing. That could mean that this is not a shaman, but an ordinary man wearing a ceremonial headdress. That actually would make more sense after factoring in the birth canal. This could have been a cave where ordinary men were initiated or purified in some way. Black Paint. I’ve read that in this region black pigment was a “male” color for pictographs. It was used in male initiation ceremonies. Could this have been a place where young men were initiated into adulthood? Could it have been a sweat lodge for men to ceremonially purify themselves? The cave has a distinct male energy for sure so something along these lines was likely. 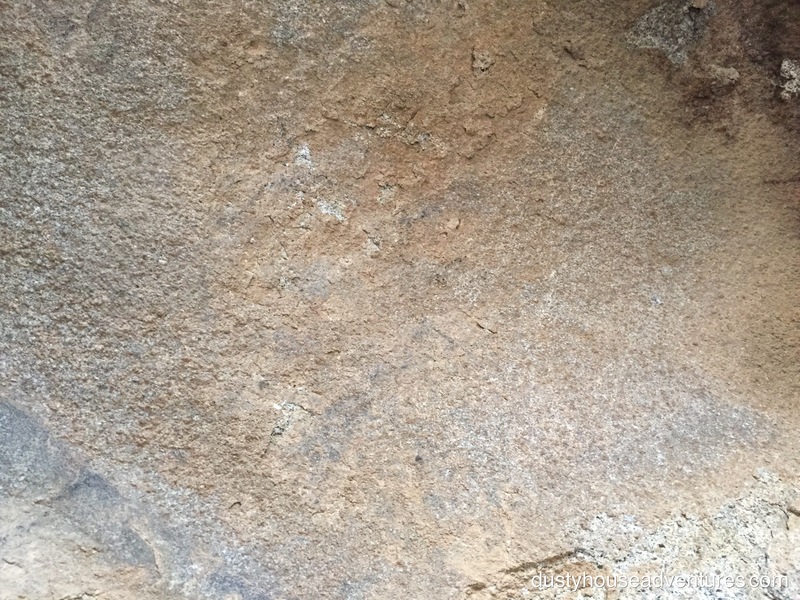 Very near the exterior of the cave is a boulder with hundreds of cupules (small grinding holes about 1-2 inches in diameter) marking its surface. Sometimes in the Southwest, following puberty ceremonies, the celebrant carved a cupule into a boulder like this one, adding his or her number to the many. Perhaps that is what happened here. Boulder covered with cupule petroglyphs. In other parts of the country, the shaman would write the order of a ceremony in images on a birch bark scroll and refer to it like a recipe. Here in the Southwest that would have been done on stone instead. It is possible that this panel is actually a ceremonial recipe that once recorded could be repeated over and over again with precision. When used in such a way, the cave would become a sacred place and as much an intrinsic part of the ritual as the ritual itself. It would be a holy place, a dedicated temple. So in conclusion, my cursory amateur reading of this cave would be that it was a male ceremonial space in which a ritual related to rebirth or spiritual purification took place. Unfortunately, some of the images in The Infinity Cave have been destroyed. They could have given us more clues about the nature of what happened in there. This is the point at which the lover suddenly turns off all contact and leaves you blinking in the darkness wondering where you stand. You know you’ve experienced something magical, but it isn’t for you to own. All there is to do is cherish the lessons that were shared, try to apply them to life’s bigger picture, and move on. I suppose that’s all we can do now. Adieu pour maintenant, mon cheri. She dramatically exits stage right, clutching her chest, a tear glistening on her alabaster cheek. HA! He wishes. There are plenty of caves in the desert. Next! She dramatically exits stage right. I dedicate this male fertility cave blog post to the ladies. Girl power. What is the filter you are using on the gylphs? They really make them pop.